Nobody needs hundreds of VPN locations, but could you get by with just 7? 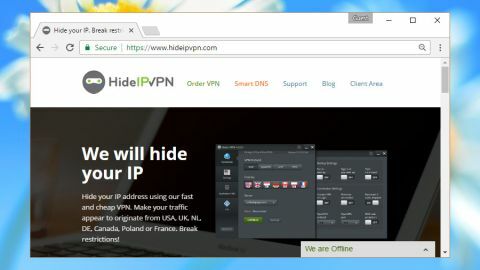 HideIPVPN's speed, ease of use and native clients make for an appealing VPN – if you can live with the very short location list. How many VPN locations do you really need? The hundreds offered by some services will be overkill for most people, but HideIPVPN's grand total of seven doesn't impress us, either. The geographical spread of VPN locations is important, but HideIPVPN only covers Europe and North America (UK, Netherlands, Germany, France, Poland, USA, Canada). The service does also have some welcome advantages, like a complete set of clients for Windows, Mac, iOS and Android. A bundled Smart DNS service may unlock some sites without the performance hit of a VPN (not Netflix anymore), and there's support for a wide range of protocols, including SSTP, OpenVPN, SoftEther, PPTP and L2TP/IPSec. P2P is also supported, though only on the German or Dutch servers, and you're able to use three simultaneous connections. HideIPVPN is a little more expensive than average at a chunky $9.99 (£8, AU$13.10) for a single month or $5.83 per month (£4.65, AU$7.65) if you opt for a year. You can cut this to $3.33 (£2.65, AU$4.35) by choosing the Poland VPN, UK VPN or US VPN plans, but they'll give you an IP in those countries only – some other VPNs offer unlimited switching for a very similar price. Whatever you think about the price, HideIPVPN is at least confident enough to offer a free trial of the real service. The firm won't restrict your connection or stop you accessing the server you'll most want to use: instead you get 24 hours to use the VPN just like any other customer. HideIPVPN explains its general logging policy in the VPN feature list: "No logs. We don't keep any server logs." However, it offers almost no details anywhere else. As we write, for instance, this is how the support site answers the question: What information do you store? "We do store your name and your billing details. We do NOT keep any server logs. troubleshooting." That's more like a scribbled reminder than an attempt to provide real information, yet checking the Wayback Machine suggests it's been that way since March 2015, at least. We found an odd note that P2P is only available on the German or Dutch servers, and if you use P2P on any of the others "you will be warned by our system", and if you do it again your account will be terminated. This suggests that even if there are no ‘server logs’, there's still some monitoring or analysis of what you're doing, and maybe a record that you've done it (a note on your account that you've been using P2P on server x at time y, an email from HideIPVPN giving you a warning). Finally, there's an unusual clause that "HideIPVPN may request proofs of your identity (card ID, driver license, etc.)" if the order "looks suspicious" or "is made from a high risk country". That's their call, but if you're a customer looking for privacy then sending a high-value personal document to any third-party, when you've no idea how it might be treated or stored, is almost certainly a very, very bad idea. HideIPVPN's free trial doesn't ask for credit card details or any other payment information. Just give the company your name and email address and login details arrive within seconds. Download links point you to the Windows, iOS, Android or Mac clients, or you can explore various tutorials to help set up the service manually. We opted for the Windows client, which proved almost entirely hassle-free. Installation was speedy, we selected a flag to represent its location, tapped Connect and were anonymised within a few seconds. Some countries have multiple servers, and you can view and select these individually if you prefer. There's no current status information such as latency or load, but in theory a ‘Sort by speed’ button should bring the fastest server to the top. We're not entirely convinced – a couple of times we got better performance by selecting what was supposedly the slowest server – but there's no easy way to guarantee a good server choice, and we'd rather have the feature than not. There are also more advanced options, including protocol selection (SSTP, OpenVPN, L2TP and PPTP), port and TCP/UDP selector, DNS leak protection and the ability to close selected apps if the connection drops. We've seen more powerful clients, but it's still a nicely judged mix of functionality and ease of use. The news got even better with our performance tests*. The ‘worst’ location was the US, which still delivered 25Mbps download speeds as a minimum. Canadian and European connections consistently gave us 30Mbps as a baseline – fairly close to our normal non-VPN speeds – and were usually much higher. Exactly what you'll see will depend on your location and connection, but we don't think you'll be disappointed. The positive note continued with our final privacy tests, where HideIPVPN successfully cloaked our identity and blocked both DNS and WebRTC leaks.